Make September your lucky month and start your next winning streak at SlotoCash Casino with free chips, free spins, and freerolls! Spin the reels on the best online casino games and test your luck with all the free spins and free chip coupons listed below. Keep an eye on this thread for new no deposit bonus coupon codes that will be added to the list as they are released, and if you find any SlotoCash no deposit coupons please share them below in the comment section. Most countries are welcome at SlotoCash except Moldova and Israel. Good luck and have a great month! Max cashout $180; Wagering 60x; Standard free bonus rules apply. Redeem the coupon code in the casino cashier. Do not use two free bonuses in a row. Expires ? 60x wagering requirement on slots, keno or scratch cards; maximum cashout applies. Max bet rule applies. Do not use two free codes in a row. Expires 7 September 2018. 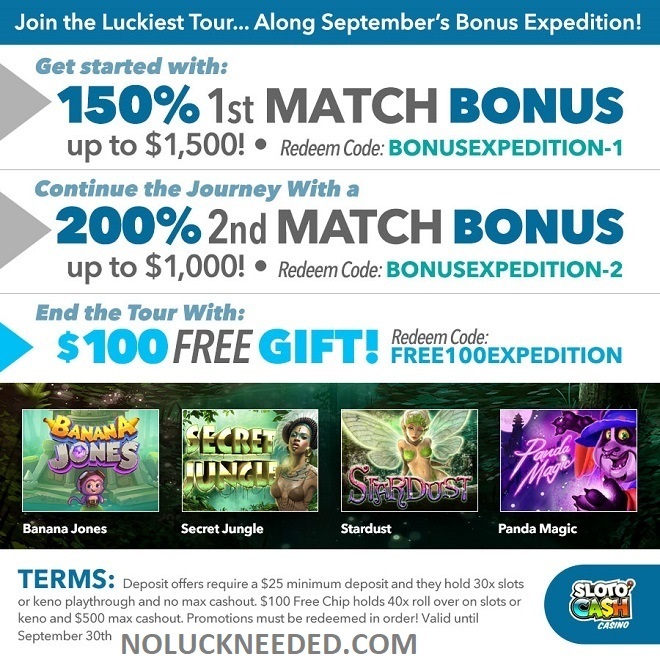 Name: NoLuckNeeded September Freeroll; Game: Paydirt; Starts: 1 September 2018 00.01am EST, Runs: 30 Days, Buyin: $0, Add on: $0.25; Prize: $200 *Tournament also runs at Uptown Aces and players can enter at both casinos. 50 Lucky 6 Free Spins! Mzmelabella, Thanks for the code! Happy Father's Day! If anyone gets the Sloto mag, please let me know! I just got the sloto mag! Fall Sloto Mag Trvia Answers - give Your Unique $33 Code to Live Chat with answers.